It is nighttime in Muir Woods National Park, and we wonder what animals might be scampering around under the giant redwood trees. This is what those trees look like during the day. Beautiful, no? At night they look like looming versions of that belligerent orchard in the Wizard of Oz. 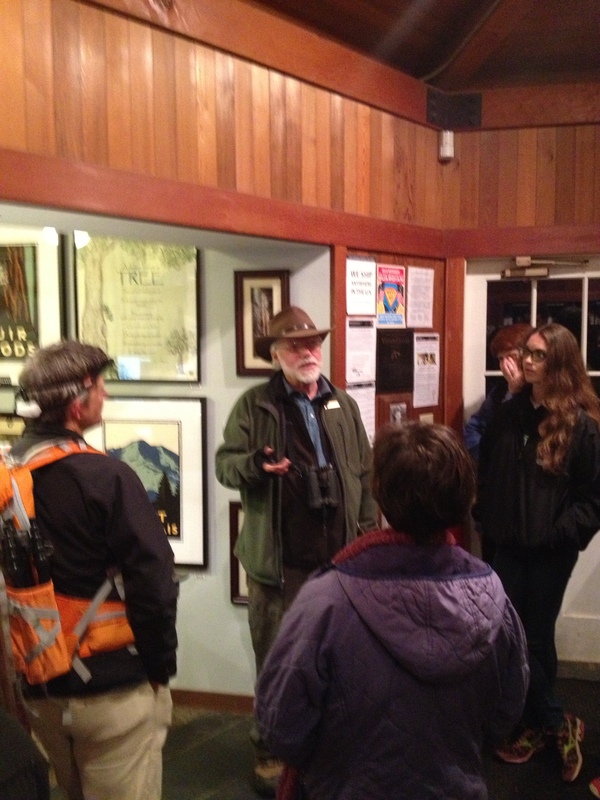 Before heading out on the two-mile loop around the park, the leader of our BioBlitz “Mammals and More” inventory hike, Dave MacKenzie, says that it is possible to see coyotes, raccoons, mountain lions and Townsend’s big-eared bats in the popular park after the sun sets. MacKenzie makes sure to say it’s possible to see charismatic megafauna such as coyotes, raccoons, mountain lions, and bats. It’s even more possible these whip-smart critters took a hike as soon as they got a whiff of the clumsy-if-well-intentioned Homo sapiens sapiens tromping around their neck of the woods. “What do you hope to see?” asks Debi Stein, another inventory guide. What do I want to see? 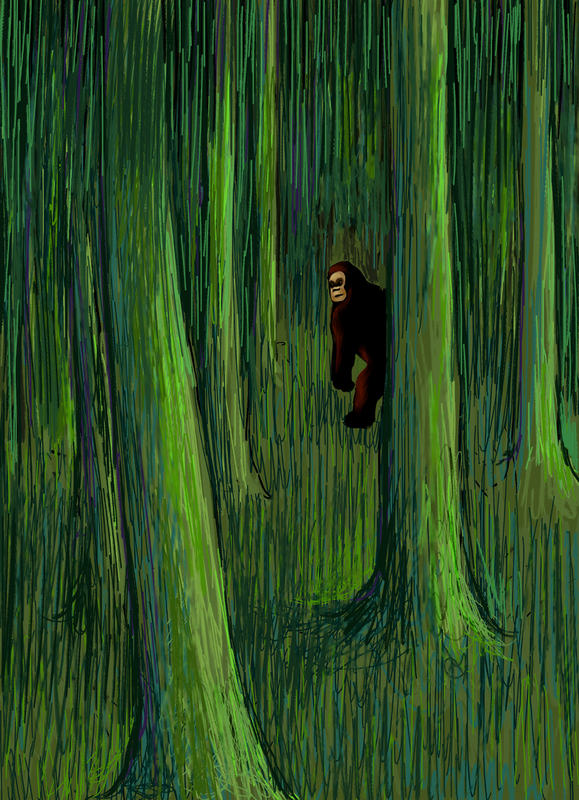 Homo dubious, an endangered species popularly known as sasquatch, is the largest primate in North America. Similarly endangered subspecies include Yeti (indigenous to the Himalaya) and skunk ape (indigenous to the American South). 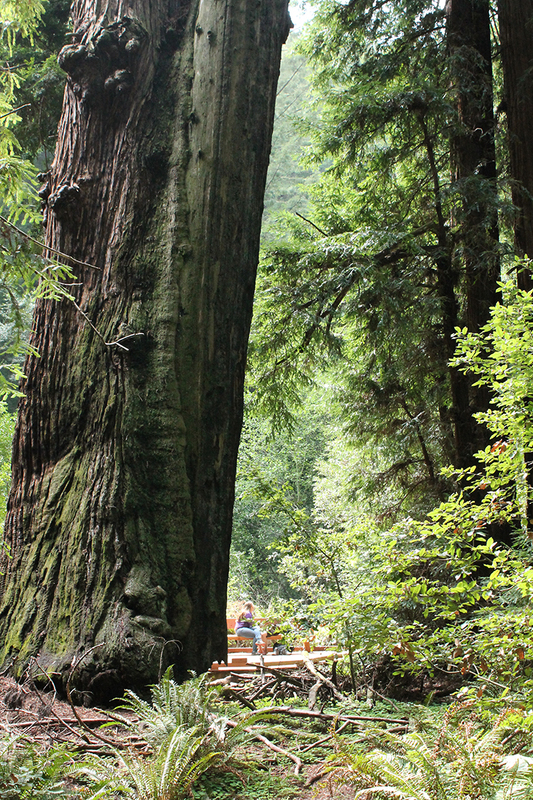 Human activity along the West Coast has cut off sasquatch migration corridors, which may be why the species is not listed among Muir Woods’ mammal population. Or it may be because they don’t exist. Photograph by David Barkasy and Loren Coleman, courtesy Wikimedia. This file is licensed under the Creative Commons Attribution-Share Alike 3.0 Unported license. 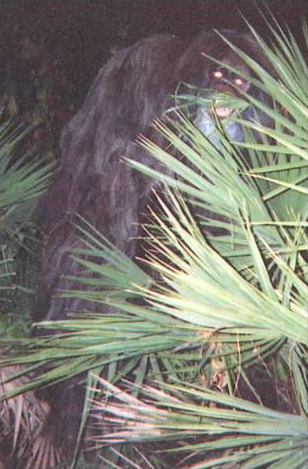 Eagle-eyed National Geographic financial adviser Andrea spotted a sasquatch, and took a nighttime selfie (squatchie?) with the elusive ape. Though we don’t see any big mammals, we are treated to a little one and a nice, quiet walk through a forest that can bustle with visitors during daylight hours. It bustled with visitors at night! 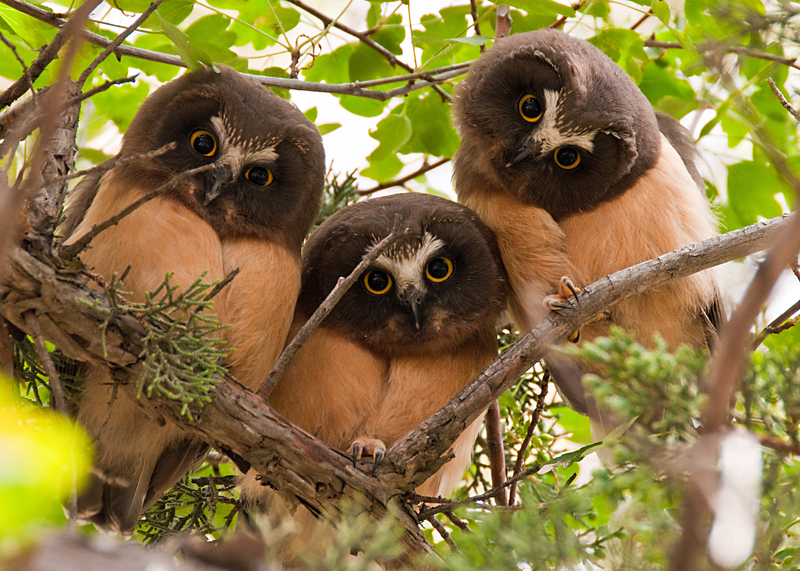 We ran into one inventory group trying to meet the beetles, another canvassing for salamanders, and a lot of latecomers to the owl inventory asking “who?” We heard these juvenile northern saw-wheat owls, but, alas, never found out who they were. Photograph by Kathy and Sam, courtesy Wikimedia. This file is licensed under the Creative Commons Attribution 2.0 Generic license. Throughout the hike, MacKenzie showers us with interesting facts about the forest. 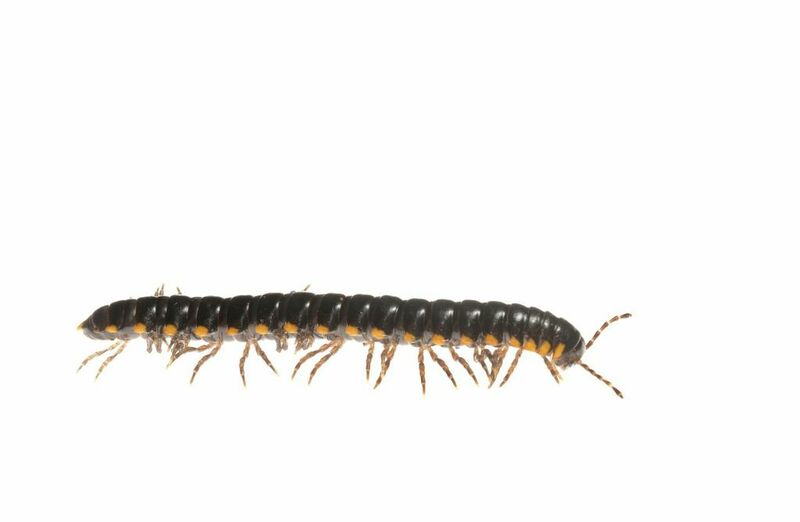 He stops and shines his flashlight on a millipede crossing the trail. 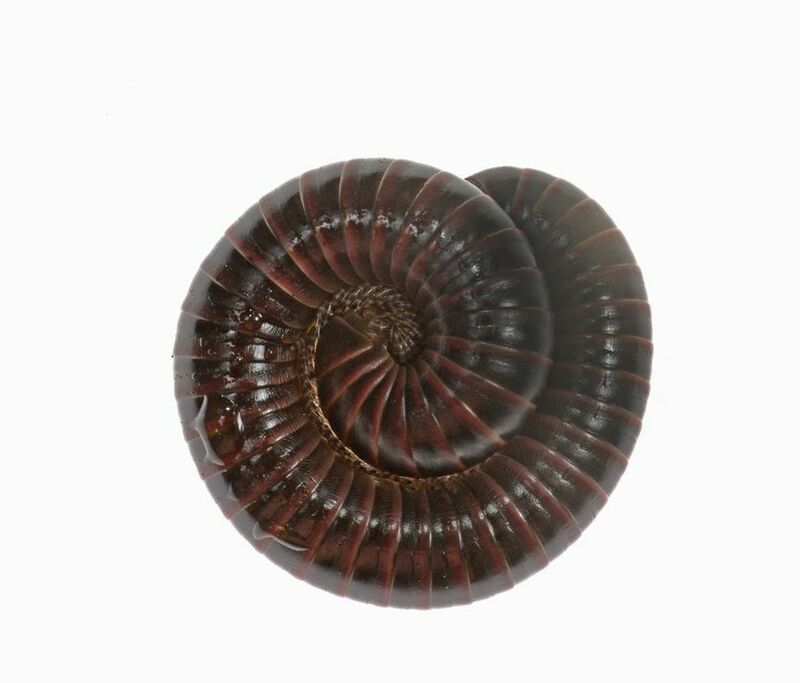 Why did the millipede cross the road? To get away from the skunk. They’e also all over the place, making them frequent victims of vehicular milip-cide. Vehicles being, of course, human feet. Park authorities decided not to prosecute National Geographic unit leader Melissa. Thank you, NPS! A few minutes later, he shines his light on a fallen tree bridging a creek. “Raccoons will run right across a branch like that,” he says. You know what else runs across branches like that? 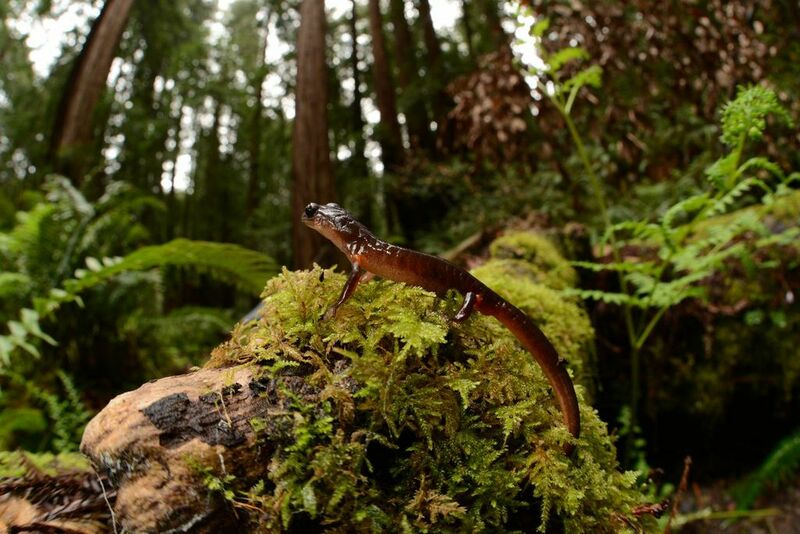 Salamanders like this one, studied by Nat Geo grantee and inventory leader Rudolf von May. A volunteer docent assisting MacKenzie, Chris Nichols, scans the forest for animals while holding a clipboard. Yes, yes, you have, Chris. You just don’t know it. 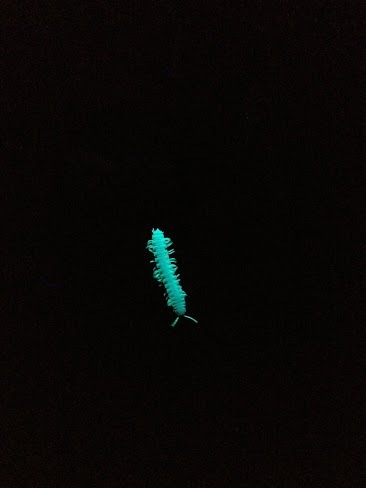 Blacklights like the one made it very clear that it’s a millipede’s world. We just squish in it. The find of the night comes when our group locates a deer mouse moving through the duff under a redwood tree. “You can think of a lot of species that would like to eat that,” MacKenzie says. 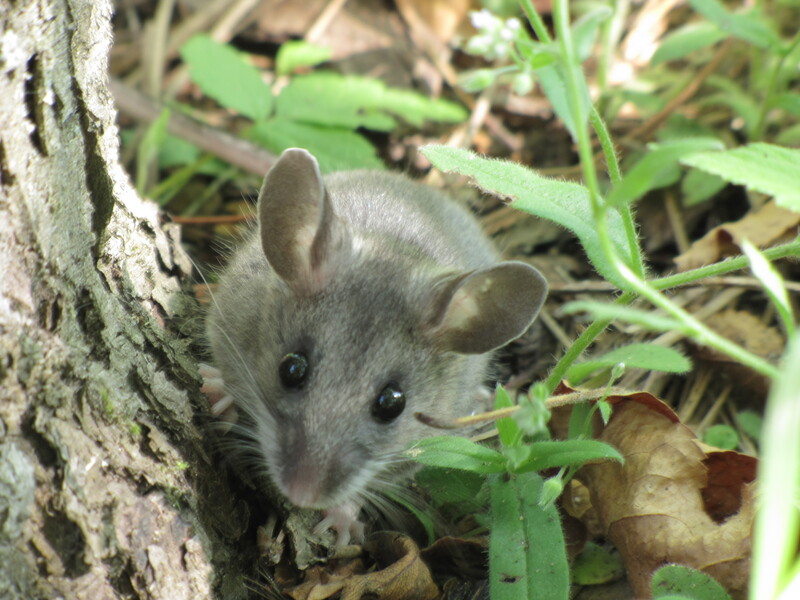 Those big doe eyes won’t get you anywhere, deer mouse. You’re a rodent and a delicacy to raptors, snakes, and science laboratories. Photograph by Seney Natural History Association, courtesy Wikimedia. This file is licensed under the Creative Commons Attribution-Share Alike 2.0 Generic license. None of those bigger species are spotted this evening, but everyone in the group is glad they came. Debi Stein of nearby Sausalito says she was hoping to see a river otter or coyote. Illustration by JNL, courtesy Wikimedia. This image is licensed under the copyleft Free Art License.